Glowstone is a block that can be found in the Nether. It gives off a dull yellowish glow (thus its name). 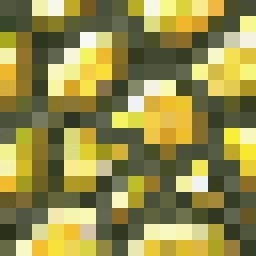 When mined, a glowstone block drops four pieces of glowstone dust. It can be mined with anything, but using a pickaxe will speed up the process. If mined with a tool enchanted with silk touch, it will drop the glowstone block instead. Glowstone generates only in the Nether. It generates in veins, trying to be at the ceilings of caves. It can be found quite easily because of the natural light it gives off, making it stand out from most other blocks in the nether. However, it does mean that to obtain glowstone the player must first get to the Nether dimension. Glowstone dust can be crafted with 4 glowstone dust. Glowstone does not craft back into glowstone dust, because it drops the dust when mined. Glowstone gives off light. Unlike redstone lamps, it is not possible to turn the light on and off using redstone. A glowstone block is required in the recipe for the redstone lamp. Glowstone is called "glow stone" ingame and its id is glow_stone, however "glowstone dust" does not have a space in its name or id. This page was last edited on 24 December 2018, at 09:16.